We teach a variety of specialized training exercises to our dogs as needed in order to ensure they will be well prepared for any scenario. Each of our clients has their own concerns, with some having specific concerns for which we teach particular exercises not normally included in our programs. One of the things we work on is strategic targeting. While a bite to the leg or arm may be immobilizing, a bite to the groin is even scarier for any would-be attacker. Zena, one of our female Belgian Malinois Guardian Plus dogs has been trained for this exercise. Another exercise we have taught on request is our child protection command. On command, the handler can send the dog to their child/ children’s side and the dog will stay by their side barking aggressively towards the threat and biting if that threat makes an attempt to come closer. This exercise is useful for children not yet old enough to handle or command a protection dog. 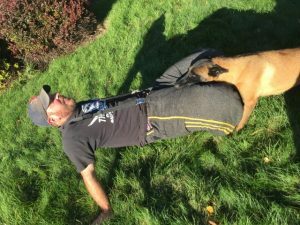 Here’s a clip of Viper, a male Belgian Malinois trained for our Guardian Plus program learning this command.